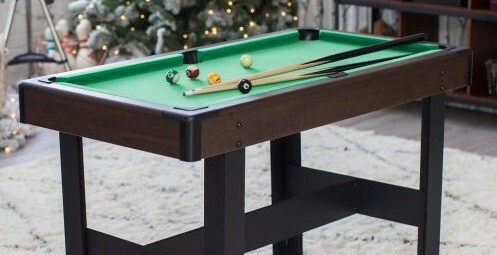 Consider your search for a small pool table over as I introduce you to the Voit 48-inch Billiard Table Set. This table will tickle your heart with its functionality and price. It’s not often that you find an all-in-one deal for just a little over $100. But this one is exactly that! 3 What Makes the Voit 48-inch Billiard Table Set the best small pool table? Finding the perfect small pool table is tricky. There are a lot of considerations to run through before you can finally decide on one. But let me tell you something about the Voit 48-inch Billiard Table Set. This small pool table is made for convenience and affordability. What Makes the Voit 48-inch Billiard Table Set the best small pool table? Seen in the photo is the Voit 48-inch billiard table. Placed conveniently inside a satisfied customer's home. the Voit is slightly bigger than other portable and mini pool tables. What’s true to life about this piece is that, it actually weighs close to the real thing. Yes, it does. So don’t let its size fool you at all. You may need a little help in moving it around as it weighs approximately 50 pounds according to some users. But I bet you wouldn’t completely mind that considering you save space with this table. The Voit 48-inch Billiard Table Set has got a different thing going design wise. Made from engineered wood specifically built to withstand the test of time. Its protective steel and rubber layer gives an extra layer of assurance that this table won’t give out that easily. It may be hard to believe this considering that it is only a little over one hundred dollars. But you better believe it, as plenty have already given it a chance and up to now is able to enjoy the table. Its foldable and adjustable steel legs were crafted to ensure that you get to enjoy the table at any given situation. 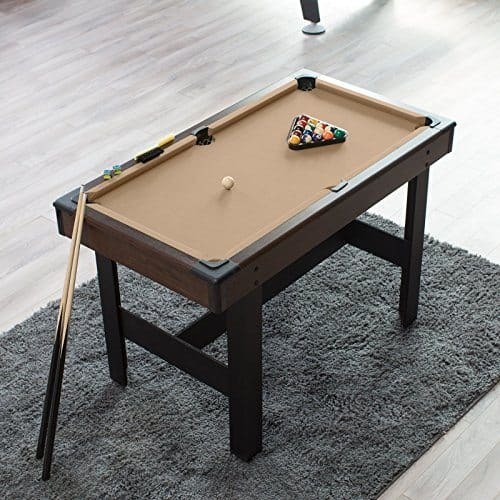 This Voit ﻿﻿﻿48-inch Billiard Table Se﻿﻿﻿t has received a total of 60% 5-star reviews, 23% 4-star reviews and 17% of other review scores. Nonetheless, its overall star rating average is 4.2 out of the possible 5 stars.